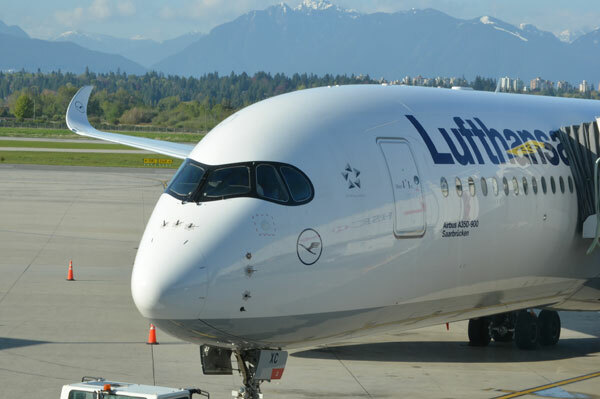 German airline Lufthansa has launched services on a flagship Airbus A350-900 aircraft between Vancouver and Munich. The route has been operating for about five years on the wings of an A330 aircraft. The switch in equipment to the larger, more modern Airbus signals a continued commitment to the summertime route by the German carrier. May 1 marked the first day of Lufthansa A350-900 services between YVR and MUC. Flight LH476 departs from Munich at 3:35 p.m. and arrives in Vancouver at 4:45 p.m. local time. The return flight, LH477, departs from Vancouver at 6:25 p.m. and arrives in Munich at 1:20 p.m. on the following day. The flights are operating on a daily basis. With the new aircraft comes new seating capacity. It has 38 more seats, up by 15% as compared to the A330. Onboard the A350, “passengers will experience a product that is very well in line with our company’s commitment to innovation, technology and efficiency,” said Hans DeHaan, senior director Canada for the Lufthansa Group, to mark the inaugural flight from Vancouver. The Airbus A350-900 is regarded as the world’s most advanced, environmentally friendly long-haul aircraft, says Lufthansa. It consumes less kerosene fuel and produces fewer emissions than other commercial passenger jets, says the airline. New technology also delivers more comfortable pressurization levels in the cabin. This is a key feature that passengers won’t see, but will likely feel. Special materials and construction techniques give the A350 a cabin pressurization rate that is equivalent to a lower altitude than in many current commercial jet liners. With this, passengers are transported in a cabin environment that is pressurized to the equivalent of about 1,800 metres, as compared to 2,400 metres in many others. Due to this, passengers reach their destination feeling more well-rested and less affected by jet lag.